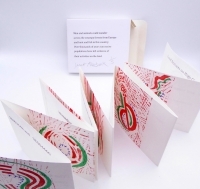 A book in a box, produced as a result of my exhibition "The Land - Layers Through Time," which was held in Grassington, North Yorkshire in 2018. The box is printed on both sides. The front reads "England was part of the Continent." This refers to the Mesolithic period in the past when the North Sea did not exist and Northern Europe was one land mass. I am impotently complaining about that nightmare called Brexit and have encased the book in a pharmacy tablet box because, due to his event, medical supplies were under threat in 2019. The reverse of the box carries the text which can be seen in photo two. The text emphasises the genetic and cultural links we have with Europe. The concertina book inside the box carries this text: "Land features on High Close...and some Askriggs. In upper Wharfedale nearly every terrace has a number of huts and enclosures, the clearest of those being on High Close and Lea Green, immediately north of Grassington, betweenSE003648 and SE004660. The fields cover more than 300 acres." These land features showing the ancient tracks and habitations near my home in NorthYorkshire, inspired the exhibition in Grassington museum and the local gallery in 2018. The reverse of the concertina book is hand printed with twelve Lino prints which are based on some of those land features. The graphic style of the prints is based on an archeological survey record, in a simplified diagramatic form. An Askrigg is the name given to some similar features surveyed in Wensleydale. Edition of 5 printed on Arches paper, encased in a pharmacy tablet box. 108mm x 90mm x 20mm.